Wireless routers are the key to building a good home network. The main function of the Wi-Fi signal is to provide a single internet connection to all your devices on the network. It also can provide a USB port for sharing an external drive or printer for all devices to access across the network. Other capabilities include a firewall, parental controls, and streaming multimedia through the network. All 802.11ac Wi-Fi routers operate on dual frequency bands, at 2.4 GHz and 5 GHz, while 802.11n generally operate on just the 2.4 GHz band. Your devices that support 802.11ac can connect to either band. At 2.4 GHz the highest speed will be 1000 Mbps while the 5 GHz allows for speeds up to 2167 Mpbs. Although actual speeds never reach that theoretical limit. There are also tri-band models which offer two 5 GHz bands and one 2 GHz band for a total bandwidth of up to 5400 Mbps. You might see routers listed as AC1200, or AC1900 for example. This just means that it supports the 802.11ac standard while the number is the total bandwidth across the two or three bands that it uses. You might also see MU-MIMO which stands for Multi-user, multiple-input, multiple-output technology. This allows a Wi-Fi router to communicate with multiple devices simultaneously and will dramatically speed up connections to each one. Ports are another important feature to look for. Gigabit ports are ethernet ports that allow you to connect devices with a wire at speeds of 1000 Mbps instead of just regular ethernet ports with speeds of 100 Mbps. USB ports, which might be USB 2.0 or 3.0, allow you to connect an external hard drive or printer to share across the network. Below we reveal our top 10 best wireless routers. Below those wireless router reviews we also provide a comparison chart so you can easily compare one model versus another. 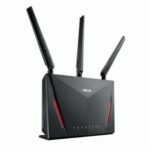 We selected the $228 Asus RT-AC88U as the best wireless router. It is the most expensive model on our list, but it has almost everything you could want in a router. It has speeds of up to 1000 Mbps on the 2.4GHz band and 2167 Mbps on the 5GHz band. Combine that with the MU-MIMO technology and you get amazing speed for multiple devices. The RT-AC88U provided speedy Wi-Fi in testing and has good range. It also has 8 gigabit ports and the interface is easy to use while providing tons of extra features not found in most routers. 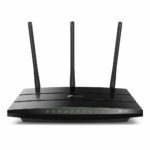 While its not a tri-band router, you really only need that third band if you are connecting a lot of devices – like 10 or more to one router. So if you want speedy performance and don’t mind paying a premium then the Asus RT-AC88U is a great choice for any home. The $224 TP-Link Archer C5400 v2 is the most affordable wireless router for serious gamers. While it is more expensive that most Wi-Fi routers, it is on the cheaper end of tri-band routers. 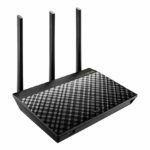 The AC5400 router has speeds up to 1000 Mbps on the 2.4GHz band and 2167 Mbps on both 5GHz bands. That makes it perfect to keep one 5 GHz band dedicated to gaming, while leaving the other two bands to handle all other devices. The Archer C5400 has 8 external antennas, 4 Gigabit LAN ports, 1 USB 3.0 and 1 USB 2.0 connectors. It also uses MU-MIMO technology to deliver fast Wi-FI throughput for multiple devices. Other features include anti-virus, parental controls, VPN server, and it works with Amazon Alexa. You won’t find a better tri-band wireless router for cheaper than this, which is why we rank the TP-Link Archer C5400 v2 so high. It is perfect for gamers or for anyone who needs fast Wi-Fi to 10 or more devices at once. The Synology RT2600ac sells for $200 and makes a good choice for any power user who wants to create a customizable home network with advanced features. In its interface it has a Package Center which has lots of add-on features like a VPN Server, intrusion prevention, download station, cloud station server, and more. Wi-Fi speeds in testing were quite good, especially on the 5 GHz band. This AC2600 router’s speeds top out at 800 Mbps on 2.4 GHz and 1733 Mbps on 5 GHz. It also has MU-MIMO technology and a USB 3.0 port. Because the Synology RT2600ac has a ton of features and customization’s it might be overwhelming for basic users who just want to get online, but it is perfect for an advanced user who wants to customize a network for your home or small office. The $163 Asus RT-AC86U is one of the best all-around wireless routers for a large home. The AC2900 rating means speeds of 750 Mbps on the 2.4 GHz band and 2167 Mbps on 5 GHz. In testing the actual speeds on the 5 GHz band were the highest of comparable routers. With the RT-AC86U you get high-end features like MU-MIMO, advanced traffic prioritization, extra security, USB 3.1 port and dual-WAN. Buyers should be aware, however, that this unit is only positioned vertically – it does not lay flat nor can it be mounted to the wall. Overall the Asus RT-AC86U is a great choice for anyone who wants fast Wi-Fi speeds and gamers who need to optimize their network for gaming. 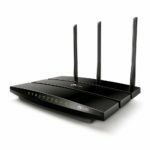 Another router that would make a great choice for most people is the Netgear R7000P Nighthawk which sells for about $182. We like that it works great right out of the box for fast speeds at long or short distances. It comes with a web interface that is is easy to use for novices or pros. Features of the R7000P Nighthawk include top speeds of 600 Mbps on the 2.4 GHz band and 1625 Mbps on 5 GHz, MU-MIMO, a USB 3.0 port, and parental controls. We think the Netgear R7000P Nighthawk is best for anyone who just wants fast Wi-Fi without having to fully customize their network or mess with lots of settings. We think the $158 Linksys EA7500-CA is best AC1900 router you can buy. It offers max speeds of 600 Mbps on the 2.4 GHz band and 1300 Mbps on the 5 GHz band. In testing the Wi-Fi speeds were really high on the 2.4 GHz band, especially at short to medium range. On the 5 GHz range speeds were still good, but not as impressive as the 2.4 GHz performance compared to other comparable models. The EA7500-CA has most of the important features anyone would want like MU-MIMO, 4 LAN ports, a USB 3.0 port, and parental controls. 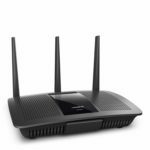 Overall we feel the Linksys EA7500-CA is a good choice for anyone with a medium sized home who wants a solid mid-tier wireless router. The Asus RT-AC66U B1 is a budget-friendly dual-band router that sells for about $110. This AC1750 router has speedy throughput, parental controls, and malware protection. Speeds top out at 450 Mbps on the 2.4 GHz band and 1300 Mbps on the 5 GHz band for the RT-AC66U B1. It includes 4 LAN ports and a USB 3.0 port. However, it does not have MU-MIMO technology which will slow you down if you have multiple devices connected at the same time. 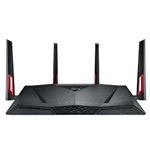 We recommend the Asus RT-AC66U B1 for anyone looking for a bit more affordable wireless router. 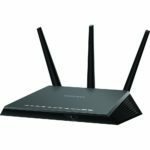 We think the best wireless router under $100 is the Netgear R6700 Nighthawk which sells for about $90. As of this writing it is also the best-selling wireless router on Amazon. It is easy to setup and use without a lot of configuration which is nice for basic users. The R6700 Nighthawk has pretty good range and throughput on the 5 GHz band, but its performance is lacking on the 2.4 GHz band. It is rated as AC1750 which means top speeds max out at 450 Mbps on the 2.4 GHz band and 1300 Mbps on the 5 GHz band. It also has 4 LAN ports and 1 USB 3.0 port. If you want a quality wireless router, but don’t want to spend over $100 then you should definitely consider the Netgear R6700 Nighthawk. The TP-Link Archer A7 is the best cheap wireless router you can get with a price around $62. Rated at AC1750 it provides surprisingly fast performance, but it does not have as long of a range as some of the more expensive routers. The Archer A7 has 3 external antennas, 4 gigabit LAN ports, a USB 2.0 port, parental controls, and works with Amazon Alexa. If you want a cheap AC1750 Wi-Fi router then we recommend the TP-Link Archer A7. The cheapest wireless router to make our list is the TP-Link Archer C1200 which sells for just $40. It is one of the best selling wireless routers on Amazon thanks to the amazing value it provides at that price. It isn’t going to wow you, but it will get the job done for most people in a small home or apartment. The Archer C1200 is the only AC1200 Wi-Fi router to make our list with speeds that top out at 300 Mbps on the 2.4 GHz band and 867 Mbps on the 5 GHz band. The speeds are still plenty fast enough to stream a 4K movie, but it is not ideal for lots of devices streaming at the same time. It also has 4 LAN ports, a USB 2.0 port, and parental controls. If you just need a cheap wireless router that still works decently then you should consider the TP-Link Archer C1200.